Viewed 5 times in last week. More about this property: 3 bedroom holiday house just 4 miles from Denbigh with lovely garden, 5 star rated and with fishing possible on site in season. More about this property: Absolutely fabulous large Welsh holiday house with 6 bedrooms and 6 bathrooms, sleeping up to 12 in a stunning location right by the water’s edge within Pembrokeshire’s National Park, with its own small private beach and quay as well as a swimming pool and games room, this property certainly has the wow factor. 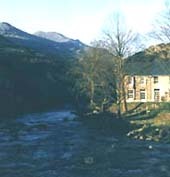 Wales is a fantastic country for a self-catering fishing holiday. With a great choice of welcoming holiday homes, whether you want to fish for trout, carp or other types of fish, Wales is a fantastic destination. Options include booking holiday cottages with fishing lakes on site, those with coarse fishing or fly fishing available close by in nearby rivers or lakes or coastal holiday cottages where you can enjoy a spot of sea fishing. Whatever type of fishing or angling you are planning to enjoy on your holiday in Wales, we hope you find the perfect Welsh self-catering holiday for you to enjoy this fantastic activity. See individual listings for more information on the accommodation on offer and the facilities for fishing either on site or nearby.